The HMD (head mounted display) marks are finally disappearing from my kids after watching nearly 90 hours of “awesome 4K VR” streaming content from the Rio Olympics. Steven Antturi, head of post production at IM360/DigitalDomain and part of the Rio OBS (Olympic Broadcast Services) team, was a little bit disappointed that they could only send the 360 video streams in 2K. As the Captain said in Cool Hand Luke, "What we've got here is failure to communicate"
Who’s going to survive with all of the digital content people launching services/content? How will providers meet the consumers’ new expectations? IBC suppliers as well as studio/network executives and filmmakers discussed how they will develop and test new ways to distribute film and TV content to people everywhere, anytime– especially since the IP-born folks are suddenly serious competitors. It’s no wonder the future zone had wall-to-wall bodies as everyone tried to figure out what the content was going to look like, how they were going to deliver it and most of all, how they were going to monetize the stuff. The seismic shift was a major part of the discussions (as was content security) on the IBC floor and behind closed doors. At the same time, NBC executives are trying to figure out how they can optimize their investment in the 2018 winter and 2020 summer Olympics. The 2017 challenge for all networks, studios, stations and content providers and developers – including YouTube, Facebook, Alibaba and others – is that everyone is rushing to dominate local, regional, national and global markets. An unstated concern though was that the sheer volume could overwhelm, confuse, tire, and turn off the consumer. IP-only players have little to lose, while established firms have to retain existing customers and capture the next generation of viewers. VR could open that path for them. Cord, no cord, self-contained, phone-attached people with HMDs were bumping into things throughout the halls at IBC. Almost everyone was demonstrating how they are going to help people shoot, produce, distribute and view VR content. What IBC clearly showed is the waters are muddy … and they will get bloody. Hint: Those who offered the complete solution at the show were selling something! Intel’s CEO Brian Krzanich discusses Project Alloy with Terry Myerson, executive vice president of Microsoft's Windows Devices Group. Krzanich claims Alloy contains everything you need to have a VR experience without extraneous components. It includes the computational and graphics power to create the virtual images and an internal battery for power, as well as 3D cameras and sensors powered by Intel’s RealSense motion tracking technology. While the HMD folks like to say they’re ahead of the content people, it isn’t quite true. There’s a big difference between announcing and shipped/sold devices. Hooked – VR augments the viewing experience by hijacking the viewer’s senses and taking them into the alternate world for a short period of time. Extensive discussion has already taken place on the possible issues of the effect of the altered state. The initial challenge is to deliver a full-fidelity experience for the viewer that recreates every photon the eyes could see and every small vibration the ears could hear. According to people who know this stuff, humans can process about 5.6GBs of sight and sound. Nielsen’s law of the Internet means that’s about 200x what the internet can provide. 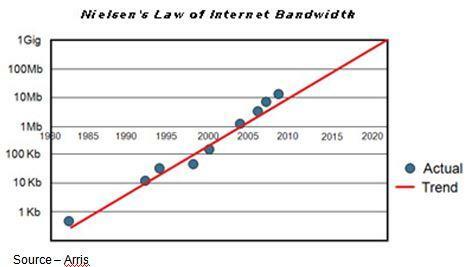 It’s the Law – Proposed by Jacob Nielsen years ago, Nielsen's Law is similar to Moore's Law of computational power. However, bandwidth is growing at a slower pace and is rapidly being outstripped by data distribution requirements. Films and video are typically shot at 24 – 30fps (frames per second); and since your eyes can easily handle higher speeds, new production options are being tested. To meet the need for “live” streaming events 60, 90, 120fps content is necessary to eliminate motion blur and disorientation. Refresh rates north of 60fps are needed – especially for OTT streaming – to cut down lag, which means more responsive experiences. James Cameron is considering higher speeds for Avatar sequels and Ang Lee’s (IBC keynote speaker) latest 4K film, Billy Lynn’s Long Halftime Walk, was shot at 120fps. 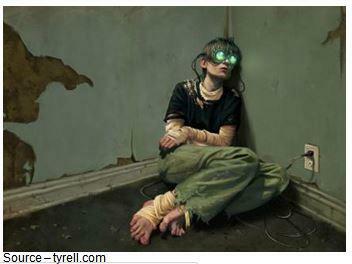 Immersive VR multiplies the delivery challenge. Lewis Smithingham, of 30ninjas and a speaker during a session at the future zone, has been extremely busy shooting and producing 360 and VR films around the globe over the past two years. He told the audience that many of the camera, workstation and software tools he has been testing were finally appearing at IBC. To experience VR at its best, Lewis took a break from presentations and meetings to treat himself to an evening at Virtual Reality Cinema, the world’s first VR-centric theatre. 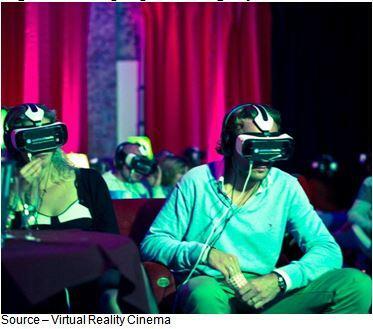 Immersive – The Virtual Reality Cinema in Amsterdam was the first theater to show the widest array of immersive 4K video. He pointed out that IMAX already has plans to deliver on the technology’s promise and full potential. He’s certain others will follow. Britain’s ICO (Independent Cinema Organization) made similar projections, saying VR cinemas could profitably coexist with multiplexes, existing theaters and as free-standing facilities. Regarding the VR audio cues, Woody Woodhall, of Allied Post Media, is convinced that compelling 360/VR will absolutely require high-resolution, 3D audio to deliver a true immersive experience for the filmmaker and the viewer. They love the broadcaster’s version of VR. Interest Dynamics – Google Trends shows the growth of online search interest in VR since its first introduction. Netflix, Hulu, studios, networks, stations and social sites are all delivering or setting plans in place to deliver IP video to meet consumers’ demands. The volume of wire/cable and wireless OTT video traffic is growing exponentially. Lewis’ Conan 360 project earlier this year was one of the earliest TV tests. The network, studio and O’Brien felt it delivered a kind of entertainment (and financial return) beyond their earlier expectations. In addition, Nick Bicanic, of RVLVR Labs and a VR shooter and technology developer, also feels 360 video will be an important medium. His 360 documentaries and concert videos in Haiti, Cuba and Africa have given tens of thousands of people the opportunity to enjoy the sights and sounds of distant locations simply by donning an HMD, sitting back and feeling as though they are actually there and participating. 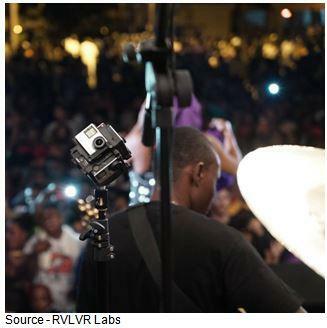 Concert Time – Nick Bicanic captured a number of festivals and concerts during his 360 video shoot in Haiti. The resulting movie lets HMD viewers enjoy the sights and sounds as though they were in the center of the action. He foresees travel, concert and special event streaming 360 videos like this becoming standard fare this next year as people take virtual trips and experience entertainment venues they might otherwise miss. The two filmmakers aren’t alone. All of the major studios – Fox, Turner, Disney, ILM, and others are figuring out how to tell narrative stories like Martian VR, Star Wars VR, Jungle Book VR and Jurassic World: Apatosaurus while wrapping the content in a secure envelope. PQ Media Global, reported consumer digital media usage worldwide grew by 12 percent last year with most of the gains coming from viewing online, mobile and other digital media channels. The biggest challenge for studios, stations, content developers is how to improve the way content is created, managed, distributed and kept secure. With all of the new content delivery platforms; networks, studios and developers are now viewing all of the three billion plus people on the Internet as prospective content customers. At IBC, Allan McLennan, of Padem Group Worldwide, noted that cable and bundled content providers are in a unique position. On the bright side, they have a proven, and paid for, pipeline in the ground to deliver content to late Millennial, Boomer and post Boomer customers who are more comfortable watching specific shows at specific times. 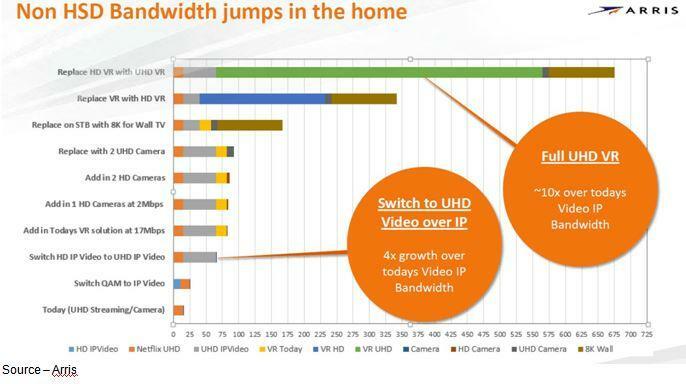 Home Connection – Arris, a leading infrastructure provider, has noted the added bandwidth to the home and the wireless requirements for smooth viewing of 360 and VR video content. Wired and wireless service providers will have to speed the performance and capacity in the near future. While the younger generations (and defectors) are more inclined to choose OTT viewing, these organizations can be powerful, robust ISPs (Internet Service Providers) for streaming venues and develop their own viewing patterns/habits with new available VR, 4K HDR content. "With all of the excitement, attention and powerful forces placing so much emphasis on VR content creation at IBC, the technology is unlikely to fail for numerous reasons–all positive,” said McLennan. Lewis and his fellow VR shooters think people will be seeing/participating in a wide range of VR content sooner than they expect. Allan agrees but we’ll dig into the changes that will have to take place in the end-to-end ecosystem with him when we’ve digested all of the IBC news in the next report.